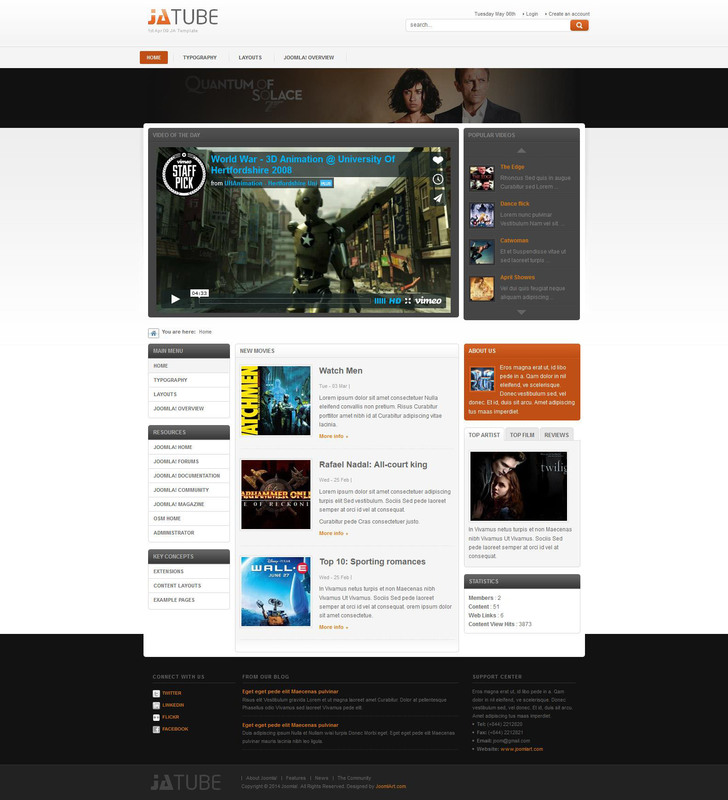 JA Tube - modern Joomla template, video or media site, Developed by JoomlArt (April 2009). Knowing that many of JoomlArt subscribers working with Joomla for a long time, and that the transition to the new platform is not always convenient, we decided to create a duplicate project Magento. We made it possible for the electronic store in Magento and Joomla named this project JA Tube. Due to the nature of each platform, we have carried out some changes regarding the distribution of embedded modules and extensions. This is done in order to best adapt JA Tube to the Joomla platform and does not impair the functionality of the most Joomla! In fact, we made the changes did not affect the possibility of using a template. For a video demonstration includes JA Tube videos through the normal module - as a replacement for the expansion of our slide show. You are provided with a video packet, and you watch the video directly on the page. Meanwhile, modules JA Content Slider and JA Tabs take place in JM Tube default extension for viewing articles. JM Tube is the perfect complement to any business. It can be used as a journal in a separate section of the site or portal solution as a whole.